Creating and managing to-do lists help us to finish the tasks on time. There are several to-do list apps that work on different platforms and device types. Sign in to them and set a due date, time for your tasks. The app will remind you at the exact time and ensures that you won’t miss the schedule by chance. To-do list apps are great tools to improve our work efficiency and supercharge productivity. They will work on Web, Windows, Mac, iOS, and Android. Being items are automatically synced across the devices, it will keep update you with the latest modifications in the projects. TickTick is one of the best to-do list apps now. It is free, easy to use and comes with an elegant interface to work on. The items can be organized with smart folders, tags, and lists. So you can locate and manage tasks in quick moments. TickTick has a clean look and highly responsive design that will make you addictive to the app. It is a powerful choice for the professionals as well as businesses to manage their team projects and smoothen the workflow. The app will work on almost every platform, device type, and browser like Windows, Mac, Web, iOS, Android, Android Wear, Apple Watch, Firefox, and Chrome. Thus you can make sure that your team members can collaborate and contribute to the projects from anywhere even on the go. Sometimes, we need to create recurring tasks like a morning alarm. In this post, we’ll tell you how to create a recurring task in TickTick. It will show all your completed and upcoming tasks in the dashboard along with the due date, time, priority level, and tags. The red color check box indicates that the task falls into high priority, yellow color indicates medium and blue color indicates low priority levels. Type your task in the text box and click the small calendar icon, to set a due date and time for it. A calendar will appear in front of you. Choose a date and set the time if it’s a normal task. There are some tasks that you need to create every week or month. They include loan repayments, Weekly classes, client meetings etc. It’s a struggling process to memorize and create such tasks at regular intervals. 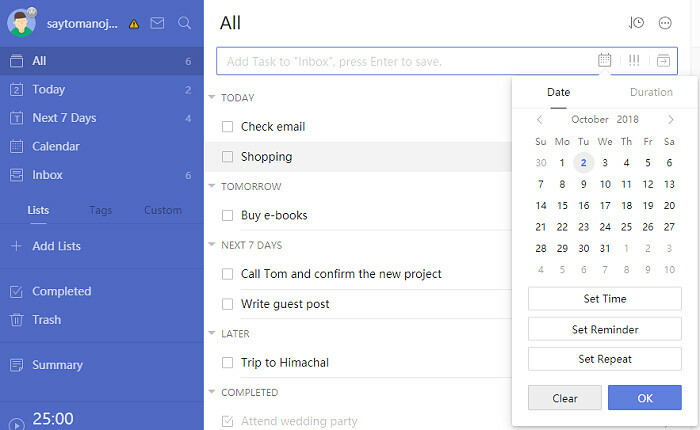 TickTick lets you create recurring tasks easily. Click ‘Set Repeat’ button that appears on the bottom of your calendar screen. Now you will get an option to set frequency. You can choose from various recurrence patterns, ranging from daily, weekly to monthly or even yearly. TickTick also allows you to set a custom recurrence pattern for your tasks. For example, you want to be reminded of a task every 5 days or every two weeks. Select the ‘Custom’ option in such a case. Customize your recurrence pattern by choosing the appropriate option from the drop-down box. The relevant dates will appear in the Calendar in a light blue color based on the frequency you set. Click ‘OK’ button to save your settings. It will bring you back to the last screen. If you want to set the last date to end the repeats, hit the ‘Endless’ button and choose ‘Ends on a Date’ option. You will be asked to choose a date in the Calendar now. Do that. Click ‘OK’ once again to save your settings.